"Gifts of Health & Caring for the Special People in Your Life"
All website purchases have the option to print out a FREE Gift Certificate on your home computer. Simple instructions below. Wonderfully convenient! Gift Certificates are available year-round for any service I offer on my Massage Services, Bodywork Services and Session Enhancements website pages. For complete descriptions and purchase those services, click those website pages at left. For your convenience, this Gift Certificates website page provides additional gift options plus unique gift pagckages for both men and women. Be sure to check back for any special menus I've developed for various holidays happening during the year such as Valentines Day, Mother's Day, Father's Day and Christmas. Special holiday menus will have their own website page, are not part of my regular menu and only available for a limited amount on time. At my office - CASH or PERSONAL CHECK - Phone / text me at 307-360-6325 or, email me through this website on the "Contact Me" page. We'll set up a convenient time for you to come by my office when I'm not with a client. I have a variety of FREE gift certificates to choose from. It only takes about 10-15 minutes. On this website page - by CREDIT CARD or DEBIT CARD easily and secure ly through Paypal. You don't need to have a Paypal account to purchase with a credit card through PayPal. PayPal Credit is also available when you check out with purchases of $99 or more. Appointment Location - All gift Certificates are for appointments at my Pinedale office. Gratuity - I've had many requests from purchasers that they have a way to include a gratuity. Gratuity is at your own discretion and can now be applied by using the "Gratuity Option" PayPal button at the bottom of this page. Expiration is 1 month from purchase date unless other arrangements have been made by gift purchaser or gift recipient. All Christmas gift certificates expire the end of January unless other arrangements have been made. Expiration of Special Value Packages depends on number of sessions in package. If you have any questions or need assistance, please don't hesitate to contact me by phone or text message at 307-360-6325. You can also email me through this website by using the "Contact Me" page at left. Click my "Healthful Handouts" website page at left. 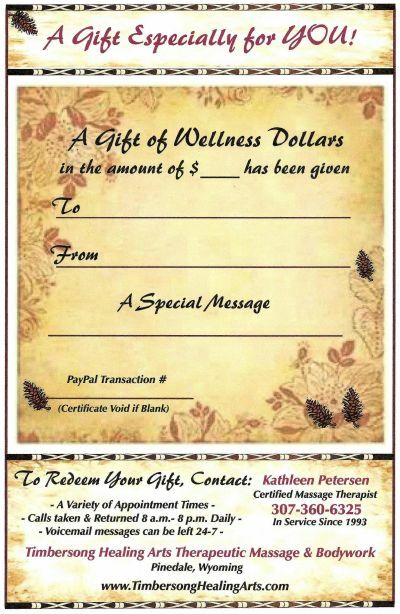 Click "PRINT Gift Certificate for All Occasions" or choose "PRINT Wellness Dollars Gift Certificate". Fill in blanks including the PayPal "transaction number". You're all set! IMPORTANT: Be sure to print and retain a copy of your PayPal receipt. You'll need to transfer the PayPal "transaction number" to the Timbersong Gift Certificate after you print it. Without the PayPal "transaction number" written on the Gift Certificate, the Gift Certificate will be void. To order from website, choose gift options below. Organic refreshment included with all gifts. For those who need a Gift Certificate quickly or aren't sure what to purchase for their gift recipient. Wellness Dollars allows your gift recipient to choose. Swedish, Hawaiian, Pregnancy Massage styles available. You know you want to purchase a massage for a gift but not sure what style to choose? Not a problem. Simply purchase the massage length below. I'll be able to assist them with options they have. An authentic Hawaiian style of stone work from Kona, Hawaii. Two massages in one session! Full description can be seen on my "Massage Services" website page. Currently, I'm the only one who offers this style of stone work in Wyoming. You can purchase CranioSacral Therapy, Inner Journey Energy Balancing and Soothing Ear Candling here. Full descriptions available on my "Bodywork Services" website page. A respite for the weary driver or jet-lagged traveler, this treatment begins with a 55 minute massage for specific areas of the body affected by sitting in one position for extended periods of time (neck, back, glutes, hips, legs and feet). Refreshing, detoxifying Grapefruit Essential Oil works to relieve muscle stiffness and reduce swelling. The refreshing, uplifting aroma clears their head, eases stress and exhaustion leaving body and mind renewed. They'll also receive a handy travel size of "Clear My Head 2Go" with essential oils that relieve congestion, boost the immune system and clear that "foggy" head feeling. Great for when you're on-the-go! "For the Active Man or Woman"
With a combination of specific massage techniques for reducing fluid retention, musle pain joint soreness, along with Soothing Moist Hot Towels, Extended Foot Massage and 100% Essential Oils, this 80 minute massage supports their fitness program or outdoor activities. Package includes a take-home bottle of Nature's Gift "Muscle Ease" with essential oils of Lavandin, Sweet Eucalytus and Ginger. Gift Certificates for Multiple Massages: A gift that keeps on giving! - People feel the difference in their body and life when receiving massage when needed. All they have to do is call. These packages also save money! Packages below are for massage therapy only for the minimum 5 sessions of the same session length. Packages below do not include Hawaiian Hot Stone Massage. (Phone or text me at 307-360-6325 for information on how to customize a package to meet your needs. Gratuity Option - I've had requests from purchasers that they'd like to have a way to include a gratuity. Gratuity is at your own discretion and can now be applied by using the "Gratuity Option" PayPal button below.